Why buy a Power Juicer? Juicing is a vital part of a healthy lifestyle and is often used for children’s drinks and family recipes. The fresh juice from a fruit or vegetable is full of vitamins, minerals, antioxidants and enzymes which are often destroyed when produce is cooked or processed. To capture all that goodness invest in a good quality power juicer. There are two types of juicer. The most common juicer is a centrifugal juicer which extracts juice by rapidly spinning pulp around a chamber (using centrifugal force). When vegetables or fruits are pushed through the top of the juicer, the machine acts by shredding ingredients using toothed blades on the bottom of a rapidly spinning sieve basket. The spinning force then separates the juice from the pulp, flinging the pulp into the pulp bin whilst the juice itself filters through to the container or jug. Masticating juicers crush fruit and vegetables using slow rotating gears (augers) and press out the juice through a perforated screen. They either use one gear pressing against its housing (single auger) or two meshed gears turning against each other (twin auger). Pro’s and Con’s of each type are:- Centrifugal juicers struggle with leafy greens but are less expensive than Masticating Juicers and are easier to clean. Masticating Juicers are slower than centrifugal but because they press the ingredients against a perforated screen they can cope with leafy greens. However, there are more parts and consequently they are harder to clean. Over all most buyers choose centrifugal juicers on grounds of speed, ease of cleaning and lower cost. The Kitchen Genie Power Juicer is a centrifugal action juicer and has a powerful 1000 Watt motor, a large 2 Litre pulp container and 0.8 Litre Juice Container with froth separator. 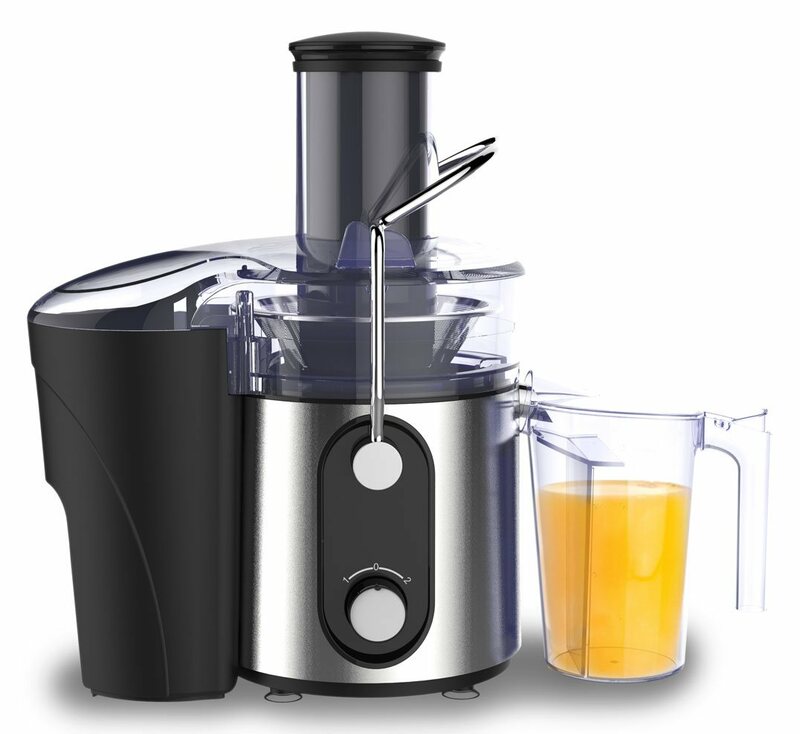 Its two speeds with pulse function make juicing so easy and the large 75 mm feeding chute means you can feed large fruits and vegetables without much need for cutting and chopping. The Kitchen Genie Power Juicer is ideal for everyday big family meals, parties and all occasions. 1000W powerful, low noise AC professional motor. 2.0L Large capacity pulp container. Extra large diameter 75mm plastic feeding full fruit juicer so no need to cut fruit and vegetables. Brushed stainless steel design including handle lock and non-drip spout. 0.8L juice container with froth separator.